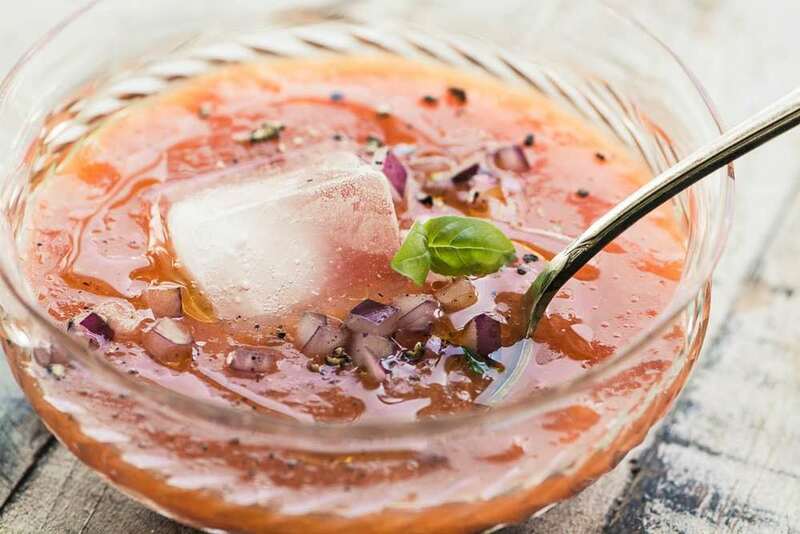 Apricot Gazpacho ~ this uber refreshing summer starter is rooted in Spanish tradition. It's a healthy, low calorie, gluten free, paleo, and delicious! Pulse the crushed apricots in a food processor a few times to create a rough puree. Don't puree completely, a little bit of texture is fine. Add the oil, vinegar, lime juice, and a pinch of salt to the puree. Taste to adjust any of the seasonings, Chill for at least an hour or 2 before serving. Serve in small bowls garnished with minced red onion, basil, cilantro, or mint leaves, fresh pepper, drizzle of oil, and an ice cube, if desired.